This trip was a nice one to get out and do as I hadn't yet been to South Colony Lakes. The plan was to climb Humboldt then traverse to Columbia Point. So on a Friday afternoon I met Chris in Westcliffe and I parked at the bottom of the 4WD road and we went up to the trailhead in his truck. The hike up to S Colony Lakes took longer than I thought it would and we had trouble finding a dry place to pitch the tent due to the remaining snow which was melting fast. We did have a beautiful sunset that night though. 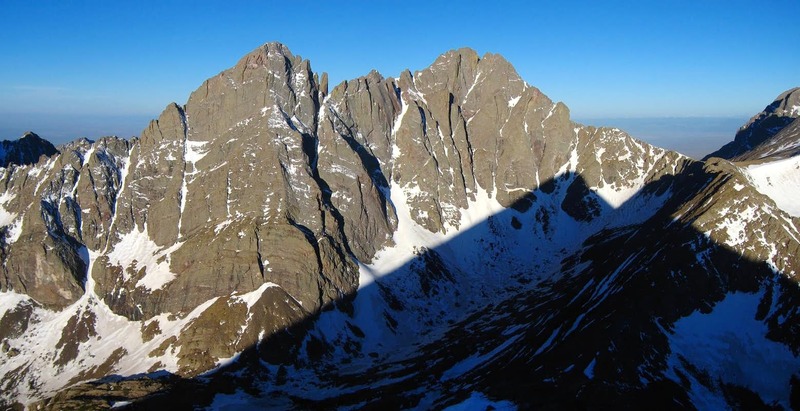 This trip was part of the 14ers spring gathering where others planned to climb the Crestones or even Kit Carson. We wanted to go a day earlier though to avoid all the people. Early Saturday morning we started up the trail and made the crest of the west ridge really quickly. I went off by myself up the west ridge of Humboldt while Chris and his dog started towards Obstruction Peak. He said he would find a place in the sun to wait. The hike up Humboldt was very easy and the early morning light on the Crestones and Broken Hand Peak was incredible. Broken Hand Peak at sunrise is shown above in the banner. From the summit, it got very windy and cold so I just took a few photos and signed the register. I then ran down the ridge back to the saddle and started on the third class ridge towards Obstruction and quickly caught up with Chris. I took a snack break and we made good time over to the Bears Playground which is a large broad saddle between Crestone Needle and Obstruction Peak. This was a nice reprieve from all the scrambling to just walk on flat ground but it didn't last long as we began going uphill again to Obsctuction Peak and back down the other side. The final ascent to Columbia Point was quite icy as the snow was melting fast and the water froze over during the night. Once at the summit though we saw the memorial and I started looking for a way down as I wanted to try and summit Kit Carson as well. I followed the point of the shuttle in the memorial plaque and started down the ridge to the south however the steep third class blocks were all covered in very steep hard snow that we weren't prepared to climb so I just conceded and we returned back the way we came. We made it back to the tent in quick time and took a nap. After cooking dinner we decided to stay another night and sleep in. The next morning just as we were leaving we saw Terry and company of their way up Crestone Peak. We watched them head up Broken Hand Pass before hiking out.